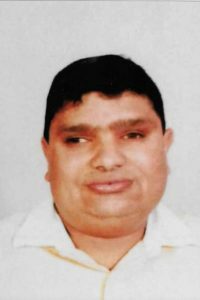 Late Niraj Juthalal Lalji Shah | Oshwal Association of the U.K. It is with deep regret that we announce the death of Mr. Niraj Juthalal Shah on Monday, 23rd July 2018 in Nairobi. He was Son of Late Juthalal Lalji Shah and Savitaben Juthalal Shah. He was Brother of Late Daksha, Chandni Yatin and Late Nilesh. He was Brother-in-law of Yatin Shah (Nyals Ltd). He was Nephew of Late Khimji (Bhagu) Lalji Shah, Late Narmada Khimji Shah, Late Shushiben (UK), Ramnikbhai (UK), Kantaben (UK), Kantibhai (UK) and Dharamshi Lakhamshi & Family. He was Cousin of Trusha Milan Shah, Parul Mansukh Shah, Leena Bindu Shah, Rajen, Nina, Jaina, Dipen, Mena and Shital. He was Uncle of Hina, Komal, Saagar, Aadarsh, Fenali, Anvita, Nimil and Neelay.